Its an idea that never felt original, felt like it could have dreamed up by anyone. It had to have come across the minds of everyone at least once. Has anybody ever wondered what those shop mall Santa's really are after the red coat comes off? It seems like an idea that could spawn several different types of scripts, could star just about anybody, and be about any type of subject matter. 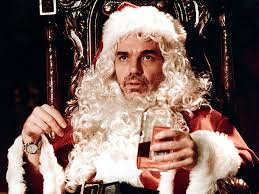 "Bad Santa" keeps it simple, and its a movie that anybody could make. But its that simplicity that finally won me over as I sat down to watch this movie. The idea that I am talking about, the idea that becomes the premise of this movie, revolves around Willie (Billy Bob Thorton), a con-man who dresses up as Santa once a year and scams people with his partner (played by Tony Cox). The entire comedy is about this premise. Yes, there is a subplot about a child who changes Willie's life, which I felt was a production note with feet. But alas, the movie still works as a whole. It is a much different type of Christmas movie that is ripe for this time of year. Billy Bob Thorton has always been a dramatic guy, but he's been a guy with great range. For not being built like an action hero, he can be quite intimidating with the right script. However, he is not the first actor who comes to my mind when thinking of comedies. Which is why he was probably perfect for this role. He fits right into the comedic scene with a great amount of ease. His revealing talent is what anchors the movie, and builds it towards something memorable. The work by Tony Cox is also very good. There are also great supporting performances by Bernie Mac and Lauren Graham. "Bad Santa" gave us just enough to make itself count, just enough to give the audience a good laugh. It is not a movie that overstays its welcome. It was not a movie that tried to drag itself out longer by creating unneeded sequels. "Bad Santa" came, did its thing and left. Sometimes, that is just enough create a connection with an audience.